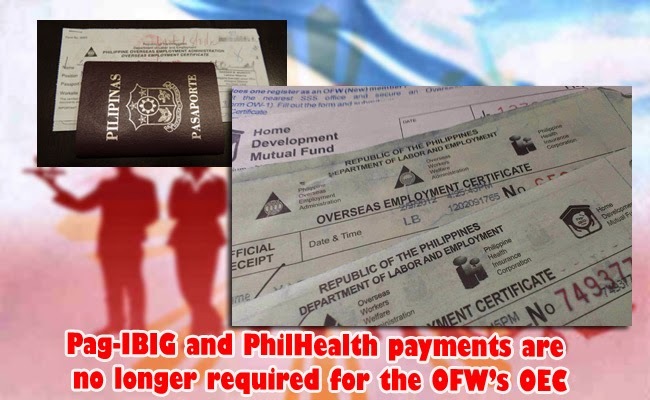 The good news is already confirmed: Philippine Overseas Employment Administration confirmed that Pag-IBIG and PhilHealth payments are no longer required for the OFW’s Overseas Employment certificate. In the Advisory number 6 which was dated March 25, 2015, POEA states that effective on April 1, 2015, the OEC or also known as exit clearance will be issued separately from PhilHealth and Pag-IBIG collections by the POEA and the processing offices to the rehired and vacationing OFWs . The issuance of the exit clearance will no longer be connected with the said payments as the agencies are separate. The OEC will be issued to the rehired OFWs together with their OWWA membership. The said decision was due to the request of the OFWs, however, the government still strongly suggests that OFWs update membership and pay their contributions to the said agencies for their own future security. They also clarify that though the payments for the two agencies are no longer required, OWWA contribution is still has to be paid. OFWs who just want to pay for the exit clearance and OWWA will only have to pay around Php1000 to Php3000. However, the collection windows for PhilHealth and Pag-IBIG will still exist in POEA. PhilHealth President Alexander A. Padilla encourages the OFWs to still pay their contributions to ensure their health insurance, as well as their dependents. He further said that thought their agency is not a requirement anymore for OEC issuance, OFWs can still pay in the PhilHealth counters in POEA’s office in Mandaluyong City and the other authorized partners as well as in Local Health Insurance Offices. The premium contribution of OFWs annually is around Php 2400. Its coverage includes the legal dependents of the OFWs, the legal and illegitimate children of under 21 years of age and parents younger than 60 years old and totally dependent on the OFW. Philhealth also covers the hospitalization of the OFW abroad.